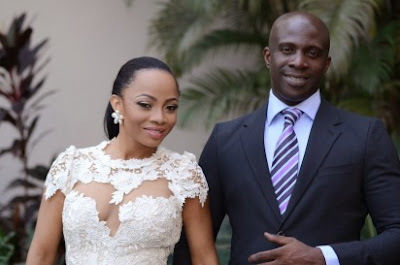 The three-year-old marriage between Toke Makinwa and her estranged husband, Maje Ayida has hit the rocks. An Igbosere High Court in Lagos today dissolved the union, citing husband’s adulterous lifestyle. Makinwa had on March 9, 2016, asked the court to dissolve the marriage on the grounds that her husband committed adultery. Justice Morenike Obadina, while delivering judgment held that Ayida filed an answer to the petition but did not give oral evidence in support of it. She said the position of the law was settled as pleadings did not amount to evidence. The judge said the issue of cruelty which the petitioner (Makinwa) relied on was established because of the “mental and emotional stress” she was subjected to by her husband. He said Makinwa had sufficiently proven that the husband committed adultery and continued to flaunt his adulterous relationships even to her face. Makinwa had told the court that her husband committed adultery with his mistress, Anita Solomon, adding that the relationship produced a child. She said since their marriage was contracted, the husband had “behaved in a way she could not reasonably be expected to continue to bear”. In her testimony, she said that after their marriage was contracted in 2014, cohabitation with her husband ceased on Nov. 8, 2015, without any child from the marriage. She also told the court of an instance where her husband threatened separation and even drafted a separation agreement because she discovered that he bought a ticket for his mistress to travel to London. The first respondent (Ayida) who replied to the petition when served, however, instructed his counsel, Mr T. O. Lawal, not to continue with the defence. Ayida through his counsel, therefore, foreclosed all evidence. The mistress (Solomon), who is the second respondent, refused to join issues with the petitioner.